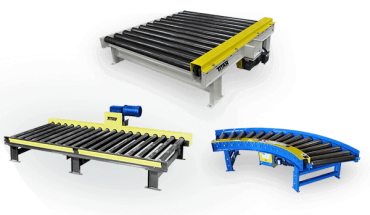 Since 1981, Titan Conveyors has been designing and building custom conveyors and conveyor systems for a broad range of applications and industries. 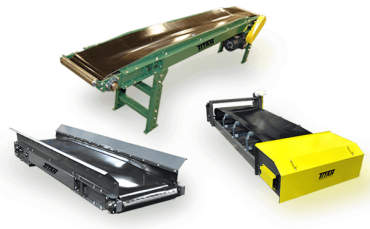 Today, Titan offers a full line of pre-engineered and custom conveyors and allied equipment. Chain Driven Live Roller Conveyors (CDLRs) are great for handling heavy product with smooth bottom or on pallets. CDLR’s are used for warehouse operations that handle steel sheet or structural shapes and using pallets or skids. This is a very versatile conveying unit for package handling, accumulation, and automobile tire handling systems. CDLR will handle large castings, forgings, parts with flat or smooth bottoms, and pallet transfer systems. Chain Driven Live Roller Conveyors are also available with Motorized Rollers. 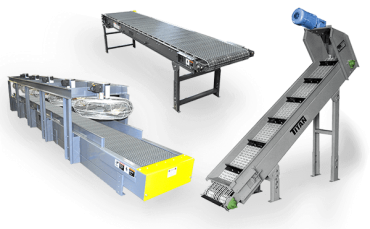 Titan specializes in custom chain conveyors and powered roller conveyor systems. Titan has designed and build CDLR systems for heavy appliance assembly lines and engine assembly lines. We believe that a successful system is dependent on the details of your business. Titan engineers have years of experience working with unique businesses like yours to help reach a solution that is dependable and increases efficiency for your business. Handle various parts up an incline with an economical Titan parts conveyor. The parts conveyors can be supplied with different cleat heights and spacing to suit your application. Belt widths can be ordered from 4" wide to 48" wide. Standard belts are PVC, neoprene, white food handling or other optional belt types per your specifications. Portable undercarriages are standard but floor supports can also be supplied. Various options can be provided to customize the parts conveyor to suit your application. When to use a Hinged Steel Belt Conveyor? 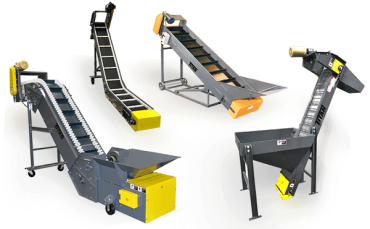 The steel belt conveyor is the most versatile of conveyors, it can be used to handle nearly every kind of part and all types of scrap. Other common names for these conveyors are Piano Hinge Conveyors, Hinged Belt Conveyors and Hinged Slat Conveyors. Most applications involve handling metal, with the material often dropping with an impact that other conveyors could not withstand. Two and one half pitch models handle most applications. Often, four and six inch pitch steel belt conveyors are needed for larger scrap, castings, forgings and any applications with heavy loads or long runs. A Titan steel belt conveyor is capable of combining in a single conveyor runs of horizontal and elevated movements. Titan's exclusive Radial Sidewings eliminates the gap between sidewings to provide a jam free operation and a more efficient running conveyor. Only Titan offers Radial Sidewings on all pitch sizes. 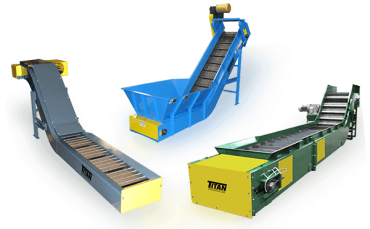 Titan Industries designs and manufactures a number of custom bulk handling conveyors for numerous material handling applications within several budget ranges. Economical for Light, Medium Duty Models 114 and 118 - These two cost-competitive Titan models are ideal choices for light and medium duty. Both are designed to contain material in the center of the conveyor belt. Model 114, with a 4 inch drive pulley and 4 inch tail, is the choice for light duty bulk material handling. Model 118, with an 8 inch drive pulley and 4 inch tail, is the answer for moving medium-duty bulk items. Heavy Duty, Large Volume Model 460 - 2 or 3 roller bulk handling conveyors are designed to handle large volumes of heavy, abrasive and granular products at a very reasonable cost. Rugged construction and certified components provide for long run and outdoor applications. Versatile and Sophisticated Model 340 - For applications where a steel belt cannot be used, but which require a conveyor with a horizontal section, incline section, horizontal configuration, the solution is the Titan Model 340 Sidewall Conveyor. (Additional configurations available.) Titan's Sidewall Conveyor is designed to quickly move product from beneath one operation, up a severe incline, and over into the center of another process, without product degradation. It can handle a wide variety of material, from bulk powders to parts to abrasive lumpy material. Standard construction is mild steel. For handling food products, stainless steel and white belts are available to meet FDA requirements. Selection of belt widths, angles of incline, lengths of straight sections and numerous sidewall heights, cleat heights and cleat centers available. Depending on loads and installation, Titan offers two models with a variety of wire mesh configurations and three different bed materials - UHWM plastic, roller or wear strip slider. Model 124 is a multi-functional load carrier for drying, cooling, or moving hot parts. It's available with two deck styles: roller bed and longitudinal. Numerous optional belt types are available. Can interface with existing conveyor systems. Model 305 is a heavy-duty incline flat wire mesh conveyor that's ideal for heat-treated, washed, dried, or quenched parts. High side rails and completely enclosed bottom pan. Cooling & Drying Conveyors are designed to interface with existing conveyor systems and are custom engineered from standard components. Increases die casting efficiencies by eliminating mist and replacing water quench. Reduces cool down time.